"It breaks my greasy heart," says director. 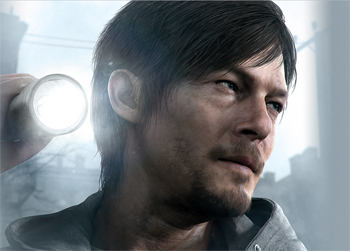 Silent Hills is, "not going to happen." That's according to filmmaker Guillermo del Toro, who made the comment at an event honoring him during this weekend's San Francisco Film Fest. Del Toro had been co-directing the title, which would have been the ninth installment in the Silent Hill franchise, with Metal Gear creator Hideo Kojima. Rumors about the fate of the project began to circulate when Konami removed references to Kojima and his studio, Kojima Productions, from the official websites for Metal Gear Solid and changed the name of subsidiary studio "Kojima Productions Los Angeles" to "Konami Los Angeles Studio" as part of a reorganization at the publisher. Reports soon surfaced indicating tension between Kojima's team and Konami, suggesting that Kojima Productions may dissolve following the release of Metal Gear Solid V: The Phantom Pain later this year. And then, late last week, it was learned that distribution of P.T., the "playable teaser" used to unveil development of Silent Hills, would cease on April 29, leading to further doubt about its status. This wouldn't be the first time a video game project involving the director has gone up in smoke. He also collaborated with Volition on Insane, an unreleased survival horror title dropped by THQ in 2012, two years after first announcing it. Though del Toro expressed confidence that another developer would pick up where Volition left off, nothing has been heard of it since.